This activity started out as a vision board for me. I was mucking around drawing and writing some hopes and dreams and ideas I had for the year ahead when my kid noticed and wanted to do on too. My twins took up the idea and ran with it, filling their paper with all kinds of ideas and dreams. But it was harder for my smallest boy to think so abstractly, and even hard for my middle child to look ahead like that. So I simplified the idea a little and put together this simple hopes and dreams drawing prompt to get them started. 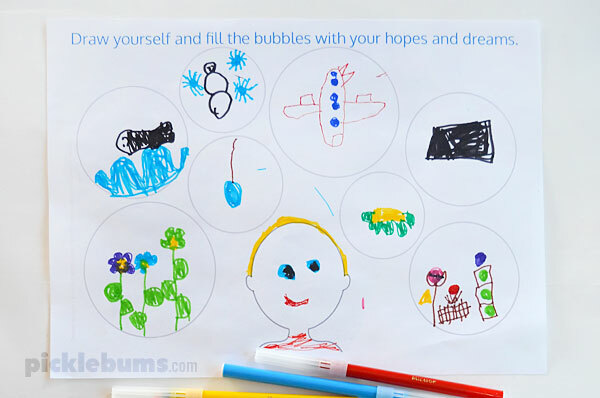 With a little direction the boys could now fill each bubble of the hopes and dreams drawing prompt with something they hoped, dreamed or wished for. The boys included thing like going to swimming lessons, winning more Angry Birds, conquering the four gap monkey bar swing, reading the rest of the Harry Potter books, learning more songs on the piano, and eating more tacos. And we all included going on an plane as we’ve got plans for a holiday this year! This is a fun and easy activity for the kids to do on New Years Eve. Make sure you save their drawings so you can get them out next New Years Eve and see whether their dreams came true and how their hopes and wishes have changed. Hopes and Dreams Drawing Prompt. 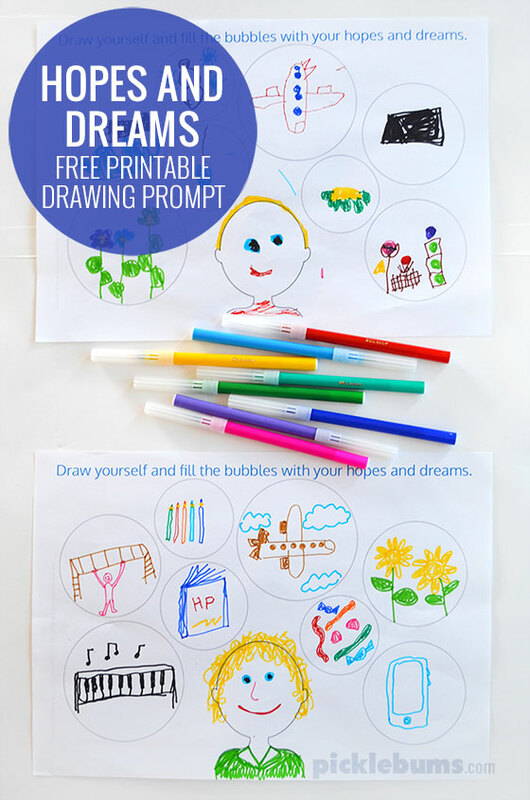 You can download the free printable ‘Hopes and Dreams’ drawing prompt here. This drawing prompt is an A4 sized pdf files. If you are printing on US ‘letter sized’ paper be sure to select ‘fit’ or ‘shrink to fit’ from your printer options. 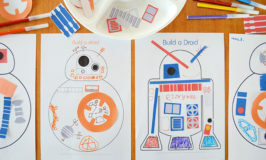 If you like this drawing prompts then check out our free printable robot drawing prompts! 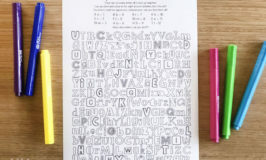 Or try our free printable road trip drawing prompts. 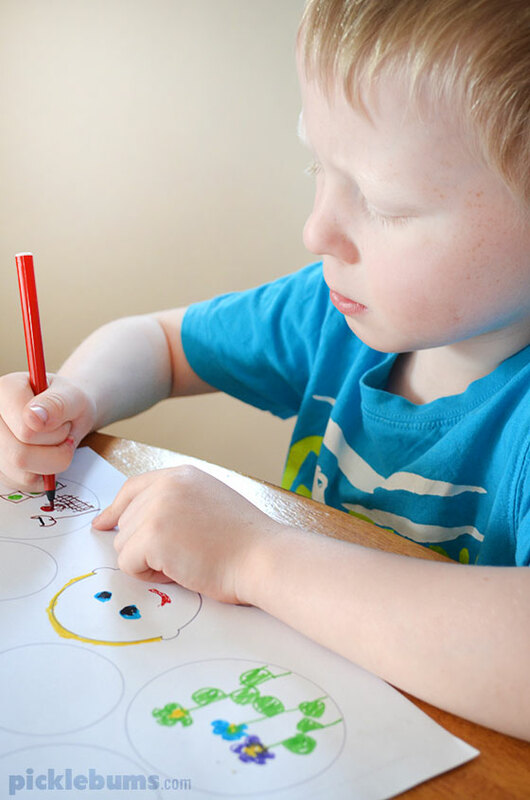 Find more fun drawing activities here. I love this! We are going to use it for a road trip. I’m going to have the kids draw what they want to do on vacation and then I’m going to have them draw what were there favorite parts of the vacation. Thanks again. I absolutely love your printables and am so grateful for your creativity and generosity! We’re getting ready to take our first family vacation ever and keeping much of the trip a surprise. 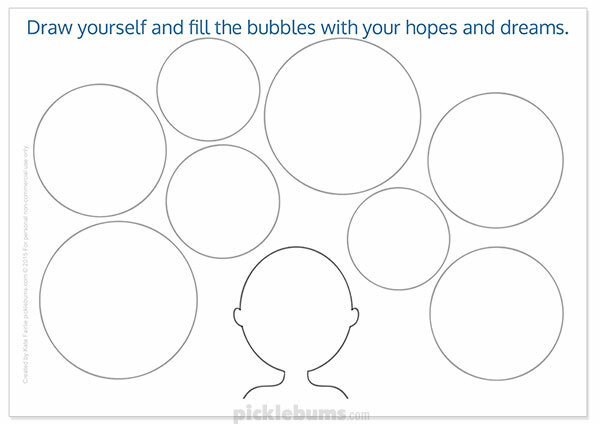 I was wondering if you could make one like this that day something like “draw yourself and fill the bubbles with what you hope to see and do.” And another for the trip home changing the last part to “with your favorite parts of the trip.”. Thank you so much for all you do!